Any Bare Root Items - Availability means Available for supply from Nov to May. Any Container grown items - Availabity means Available for supply now. 2 Year Bush = A two year old plant that has been pruned back in the first winter to form a bush shape. Generally plants will be 60-75cm in height with multiple side branches. Cropping in June to July. Fruit can be used for jam and pies. The varieties that we grow replace a lot of the older varieties that suffered badly with American Gooseberry mildew. The varieties we stock all have good resistance to mildew and the red variety Pax is virtually spineless. Plant bushes 1.5 metres apart. An ideal fruit for the small garden. Usually grown in the form of a small bush, they can be trained to any shape and are especially recommended for pot culture. 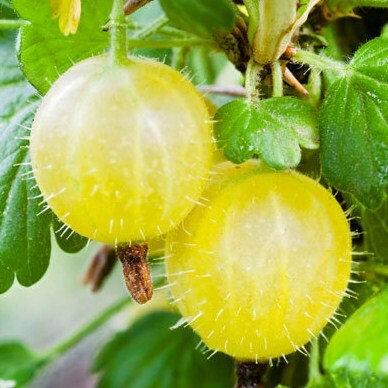 Gooseberry bushes are easy to grow, produce a large amount of fruit for their size and will tolerate partial shade conditions. They are self fertile, so one bush can be grown on its own. Gooseberry bushes are also well able to withstand harsher conditions (both temperature and wind) than many other fruits. This makes them a good choice for cooler areas. Dessert Gooseberry - Very large yellow fruit. Excellent flavour and has good mildew resistance. Heavy yields of good sized fruit. This variety is as good as Leveller and you have no mildew to contend with. Picking time mid July. Plant 1.5 metres apart. Last time what you sent me was green not yellow. Beautiful looking large gooseberries - sadly eaten by blackbird but he seemed to enjoy them! Excellent customer service and super plant quality. Arrived well packed, better than locally ordered plants. A really healthy looking plant that has settled in nicely. Looking forward to ordering from you again.